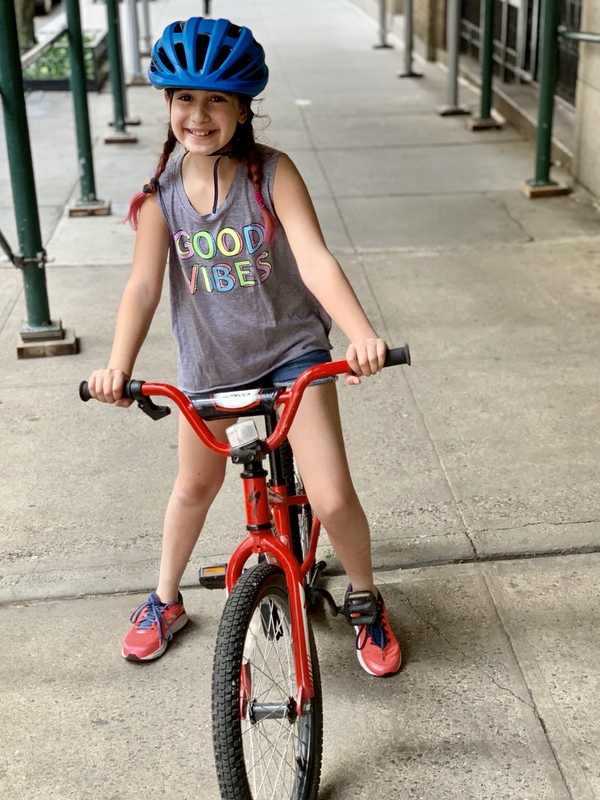 The photo is of my granddaughter taken on Friday in the beautiful weather New York City had. We are having beautiful weather in Florida, too. Imagine my surprise to find our playwright’s wife still here. They were to have left for NYC days ago. She told me that she lost her wallet with her driver license and is waiting for a new one. . Her husband is due for a treatment in the hospital on Thursday, so they will fly to New York City, fly back to Florida, then drive back to New York. In the meantime, she and I just returned from a bike ride together. That is after my morning workout at the gym, breakfast out, and doing 6 loads of laundry with some bathroom cleaning in between. I’m in for the day, and it’s only 12:30 PM here. I love riding a bike, My favorite childhood pastime as well. She is so cute. Thank you! It’s easy to ride in Florida. No hills. LOL! Yes, she does, even without that T. Thanks! She's so cute. I love biking but it is a long time I haven't bike. Maybe next time when I am in my sisters place in Holland. Biking is safe there as they have a pathway for bikers. Thank you! I can't wait to see her. It's nice and flat here for bike riding, so it's easy. I almost got run over by a bike when we were in Amsterdam. They don't stop for anyone! @DianneN Lol. I can relate to that almost run over by a bike. I think bikers have more priorities in Holland than car drivers. My German friends are mostly annoyed about how the bikers in dutch country behave when they are in Holland. @thelme55 Our guide told us they have the right of way and to look before crossing the bike path. I forgot! I almost got hit by a cab in London, too. I forgot to look to the right. My husband yanked me back on the curb so fast that he almost snapped my neck. The ice Princess is always cute, she surely loves to bike. I am sorry that your friend lost her driver license. I hope the replacement will not be too long to come. Awww, thank you! She loves everything she does. Our son sent us a video yesterday of her riding in the park with him. I love it when they spend time together. Our friend’s husband is very upset with her. She lost her phone and wallet 5 months ago, and left her wallet at the gym this morning! She’s a bit of a ditz, but so sweet. @DianneN How is it that she loses (or forgets) everything?. I hope it's not a brain problem at least. @LadyDuck She's a ditz, very scattered brained. She's always on the move. However, a nicer and sweeter person you will not find. A very full morning! Do you have a washer and dryer in your unit? Your granddaughter is adorable. Very full and yes. Thank you! Just as I began to myLot, the news broke that Notre Dame in Paris is on fire. It's horrible!!! @DianneN Yes, people are posting it all over Facebook. @LindaOHio Of course I haven't been on Facebook. lol. We're watching CNN. It's just awful! Thank you! I have. I'm shocked that Notre Dame in Paris is on fire. It's horrible. Your granddaughter is cute. I hope everything works out well for your family. Enjoy what time you have with them. That's quite a busy morning for you. After reading a post by @amadeo I saw that it's National Laundry Day so you're right there with the celebrating! Can't help but smile looking at the picture of your granddaughter. Her smile is contagious and she always looks so happy. Sweet photo of your granddaughter Dianne. That's a bummer about what happened to your friend. I don't do as much as you seem to but I do a little. I've done some laundry but had to stop cuz I only have 2 laundry lines and they're full with drying stuff. I even pulled a few weeds now I'm foolin round online for a bit. Well, it's good to see you fooling around online. I had lots of laundry from yesterday's breakfast - rags from cleaning, tablecloth, cloth napkins, plus loads of clothes and towels and sheets. @rebelann I had such a crazy busy today, that I wish we had more hours in the day. What time did you get up to do 6 loads of laundry already? I forgot to add that your granddaughter is beautiful! @simone10 I was up very early today at 5:00. I threw a load in before going to the gym. Thank you. I adore that little girl! Can’t wait to get my arms around her. @DianneN do you ever sit still? She was very cute in photos, I didn't even have a 2-wheeled bicycle and I immediately learn to ride the motorbike until I fell on the sidewalk 3 times. @DianneN I might ever learn bicycles by ride them and my balance was faltering because I wanted to chase the ball and then the bike slid so fast that it fell into the river and after that incident I stop riding bike for over 20 years. She's always so cute. I'm sorry your friend lost a wallet. Thank you! I can't wait to see her. Our friend lost her wallet and phone 5 months ago. Her husband is very upset with her. She also forgot her wallet today at the gym! @DianneN oh. She may not need a wallet. @Nevena83 She is crazy, but we love her anyway. She needs her driver's license so she can drive her car. She flew back to New York today and when she returns, hopefully her license will be here. Your granddaughter is a cutie! You did a lot of exercises today! no walks for me today as it is only 40 degrees here and very dark. I am doing laundry too! i did my sheets for the cleaners to put on our bed tomorrow and now have a mixture of clothes/towels in the dryer as i could not wash them separately as the loads are not big enough enjoy the rest of your day and relax! Thank you! The bike riding is so easy here, since the land is nice and flat. You enjoy your day, too. @Marty1 I won't ride one in Connecticut. It's too hilly for me. @DianneN thank you...Rainy day but holiday . @responsiveme Sorry about the rain, but enjoy your holiday. Don't let any rain ruin it! So glad you were able to enjoy a bike ride. A lovely weather day here. Riding is so easy here. Nice and flat so unlike CT. I'm happy you had lovely weather today! @DianneN We had a blizzard yesterday, and all the snow melted today. One could get a suntan and cool off with a handful of remaining snow earlier in the day. That is hilarious! She will be riding it when she is good and ready! @DianneN I hope so before she has outgrown the bike! You've had a busy but good day already. It's a lovely picture of your granddaughter. I am losing my mind today. I just sat down to myLot (it's 6:20PM) and the phone has not stopped ringing. I need to disconnect from life for a few days. Thank you! I can not wait to see her!!!!!!! @DianneN It does sound like you need to disconnect from life long enough to take a well-deserved bubble bath. I know it will be great when you do. Your granddaughter is so beautiful how old is she? You had a very busy morning. It might be nap time now. I'm relaxing just sitting on my tush and myLotting. If I nap now, I won't wake up until tomorrow.